It offers everything that you could want from a short break: excellent shopping opportunities, a rich and interesting heritage, a contrasting city escape, picturesque scenery and atmospheric alleyways, bountiful food markets and restaurants serving high quality local produce, and a wide choice of day excursions. On top of this, Porto has a unique vibrancy. It is a city in transition where contemporary and history stand side-by-side and where the local residents are pushing forward the boundaries of the art, music and gastronomy worlds. On arrival at Porto airport, you will be transferred to the Pestana Vintage Porto Hotel located in the UNESCO Ribeira district of Porto. Directly positioned on the Douro waterfront, this trendy hotel is a 10 minute walk from São Bento railway station with its stunning blue and white tiles depicting rural Portuguese scenes. The hotel offers stylish rooms some overlooking the river and numerous port wine lodges – Taylors, Sandeman and Calem. Time to explore the delights of Porto. If you like history, do not miss the Ribeira district; the Sao Francisco church - known for its lavish baroque interior and ornate gilded carvings; the 12th century Cathedral and the iconic Clerigos Tower. Take a stroll along the river bank and to capture stunning images of the city from the Dom Luis I bridge. For modern art enthusiasts, we would recommend a visit to the Serralves Museum. You can shop til you drop on Rua de Santa Catarina and Avenida da Boavista. And, for wine connoisseurs the Port Wine cellars at Vila Nova de Gaia are a must. Why not take a Douro river cruise (book and pay for locally). 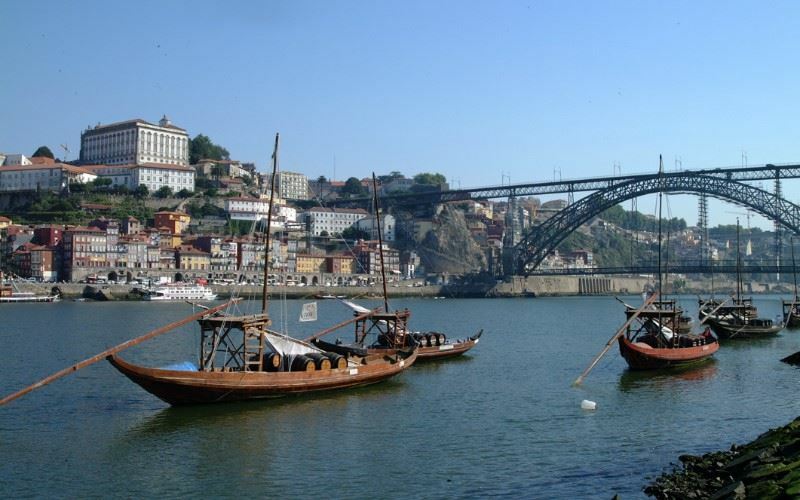 There are a variety of trips which range from a short cruise under the Bridges of Porto to a full day sailing along the river to Pinhao in the heart of the Port Wine region. The scenery, as you cruise inland, is some of the most beautiful in Portugal. The Pestana Vintage Porto Hotel occupies an unrivalled position on the heritage quayside of the River Douro, in the vibrant and atmospheric centre of Porto. The Pestana Vintage Porto Hotel occupies an unrivalled position on the heritage quayside of the River Douro, in the vibrant and atmospheric centre of Porto. Constructed from a group of adjoining century-old town houses, this beautiful property bears testimony to the development of the city over the years. Many of the bedrooms have a magnificent view across the river to Vila Nova de Gaia on the south bank of the Douro, home to numerous wine lodges – Taylors, Sandeman and Calem – which, when illuminated at night, look particularly beautiful. Opposite the quay from where Douro boat trips depart. Pestana Vintage Porto Hotel is featured in our 3-night City Break to Porto.